Yesterday the USA turned 239. Today my grandfather turned 91 years old and the US Women’s soccer team took home the World Cup for the first time in 16 years. I’m using all of these dates and years as a way to make myself feel better. It’s been well over a year since I’ve been back here, and I feel badly about that. It’s not that I don’t want to be here, but time is a quick moving thing and there’s rarely enough of it. I’ve thought this about time a lot over the past year – that there is never enough to go around. There are not enough hours in the day to do the work I need to do to survive, while at the same time writing and exploring and playing as much as I need to in order to feed myself. If I didn’t have to talk to my significant other on the phone for an hour a day to stay ‘connected’, I could actually take the time to know him better. While I live, I watch my life pass by. This weekend has been an exercise in not doing anything. Lounging in bed for longer than is appropriate for those of us in our 30s. Staring at the back of my fiancé’s head for 15 minutes while he paints. I stared just because he was there, here with me, in our house, for only the second Sunday since we started living together. Yes, it was the 4th of July, and yes, we did something, but that something felt like a whole lot of blissful nothing when we were bobbing on a boat in the middle of the Pacific Ocean. I also took the time to make cookies. Twice. I can’t remember the last time I made cookies, let alone twice within 24 hours. Aside from the time factor, or lack of it, my kitchen is not hi tech, and my stove is the most lo-fi thing in it. It’s from 1987 and it’s gas and finicky and I can never get the temperature right, so the first batch I did came out overcooked and burnt on the bottom. I would have given up, because really, who cares about cookies? But I had committed to bringing cookies to our 4th of July bash, and that now I had this free, uninterrupted time away from budgets and schedules and bookings and ISCIs, I realized that I cared about cookies. So I made them again, figuring out that if I set my oven to 300 degrees it will actually stay at 360 (obviously). I perfected them. I nailed them. And they were a hit. The belle of the ball, if you will. They were chewy and chunky and the salt cracked perfectly between teeth. They were heavenly. And I want to share them here, because I realize now it’s never too late to come back. 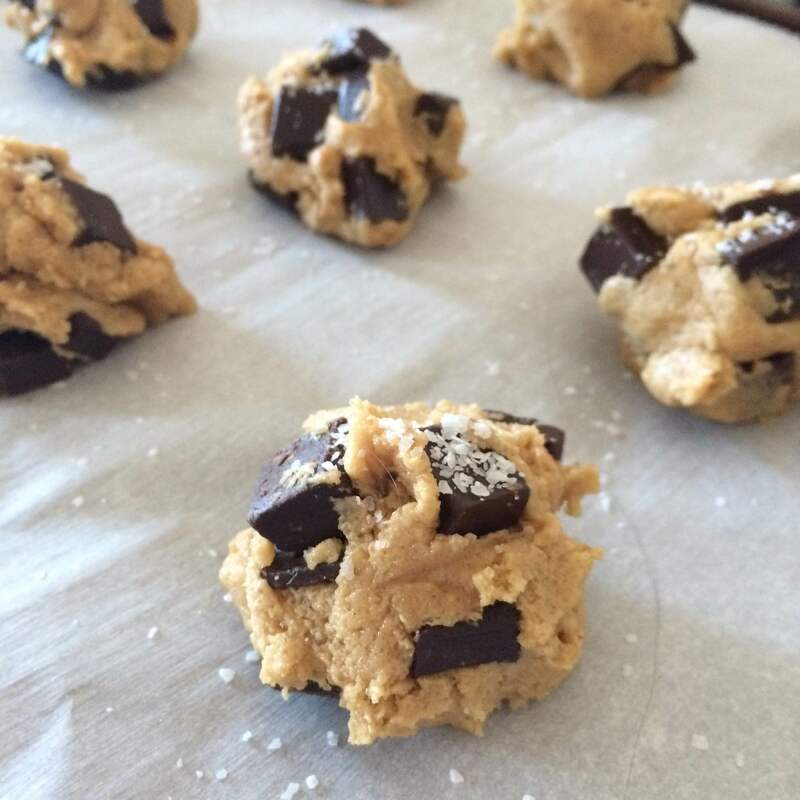 Scoop cookies into 1 1/2 tablespoon (I used a #40 scoop) mounds, spacing them apart on the prepared baking sheet. Sprinkle each with a few flakes of sea salt. Bake for 11 to 12 (I would say 10 1/2, but again, my oven is challenged…) minutes, until golden on the outside but still very gooey and soft inside. Out of the oven, let rest on baking sheet out of the for 5 minutes before transferring a cooling rack. Welcome back. Had it been nearly a year? Recipe looks wonderful.